Is it only me or does anyone else remember jumping onto the bed from the hallway – just in case there was a monster under your bed? It rarely occurs to me anymore that there might be something nefarious under my bed waiting to “get” me. However, I’ve been staying at Brother-in-Spain’s house for the past 2 weeks and decided that a peek under the bed – just to see – might help me sleep better (I might also sleep better if the neighbourhood dogs would shut up at night). Look what I found! 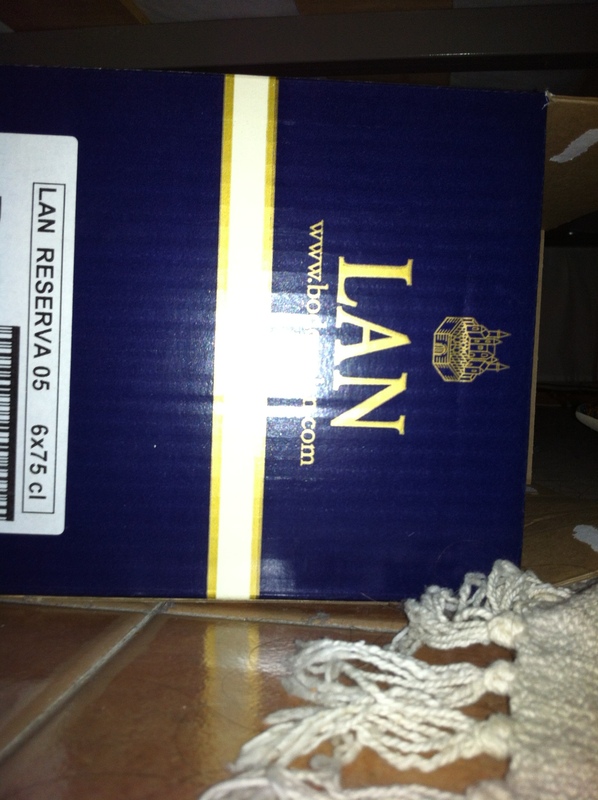 There was a box of LAN Reserva Rioja 2005! That doesn’t seem scary at all. 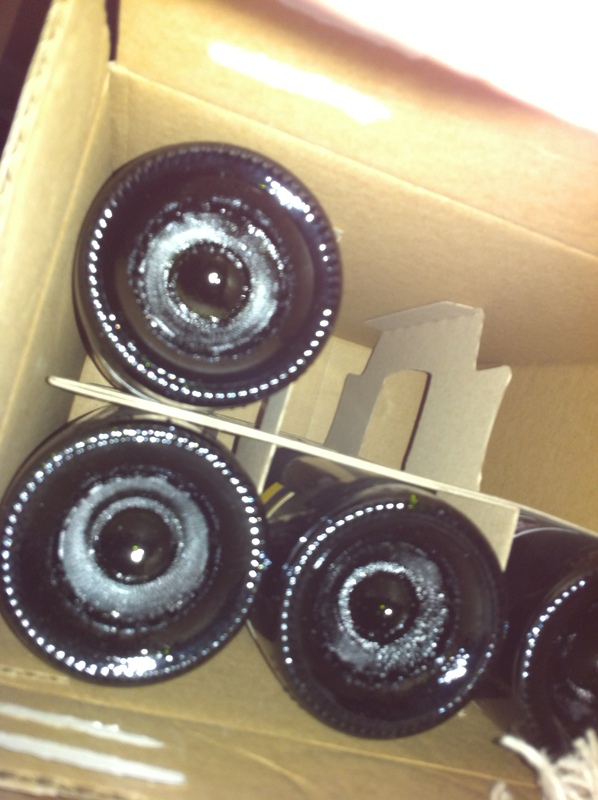 I discovered that my brother had been stockpiling wine anticipating my visit. The last time he stockpiled anything was the Y2K scare – I think he still has a year’s supply of sardines and bottled water left. I was a little scared, but I opened the box anyway and was rewarded with delicious rioja. That helps me sleep at night knowing that the monster under my bed is a monstrously good red wine. I have recently found out that packing for a vacation is both an art and a science. My wife taught me the phrase “colour story” and I was enlisted to do a “practice pack”. This art of packing involves several trips to stores and malls and subsequent trips to return the stuff that didn’t work. I think all I really needed to remember was to pack something other than a white shirt for when I met up with my favorite Malagueño – Mario,. Mario owns the olive, almond, and everything Spanish kiosk at the Malaga Atarazanas market. 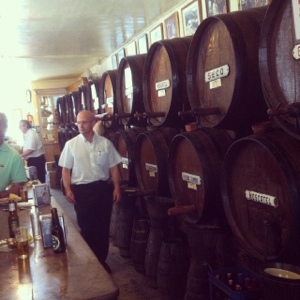 I knew that Mario would reach behind him to the wineskin hanging on the wall, shoot a stream of sweet Malaga wine into his mouth and then hand me the wineskin. 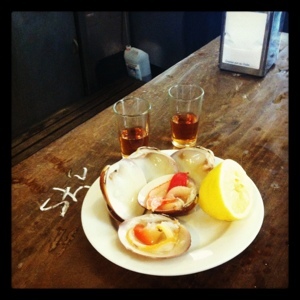 I’m out of practice for this sort of drinking and red stains on my white shirt is not part of my colour story.. 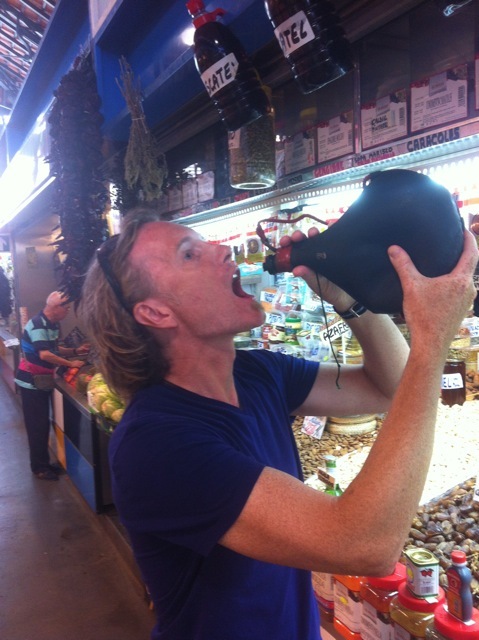 I made some notes to myself on my first full day in Spain – you can think of this as a cross-cultural blog today. It’s a coolish day here in the south of Spain – should only get up to 38 C. My first night was typically uneventful – if you consider loud dogs and freaked out roosters normal occurrences. Here is the account of my night. 1 am – in bed, fan set to level 2, it has cooled to a lovely 31 C.
3:30 am – alarmingly, the German Shepherd right next door barks incessantly for 10 minutes. Note to self – look up the Spanish phrase, “Shut up stupid dog”. 5:30 am – 3 roosters attempt to out-crow each other, or they recorded last night’s soccer game and are now watching it together. Note to self – look up a good recipe for Coq au Vin. 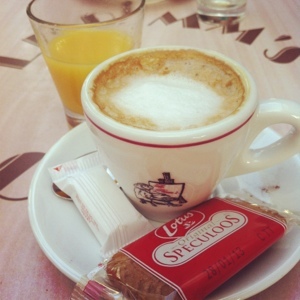 7am – Woke up so that I can have espresso when the sun comes up over the mountain. Google translator tells me that shut up stupid dog is “Cállate estúpido perro”. Note to self – memorize this phrase. I can look up a Coq au vin recipe tomorrow. 3 por 2 is my new favorite Spanish math. 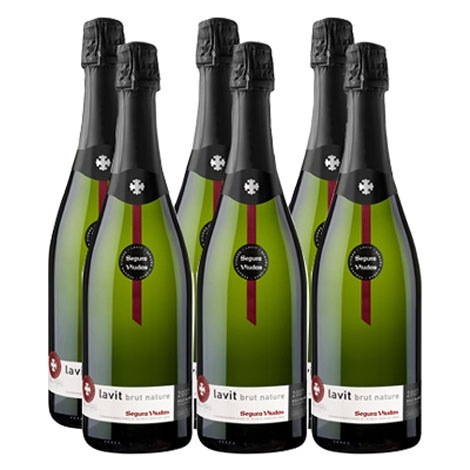 We bought 3 Segura Viudas brut nature cava – Lavit – for the price of 2. Loco! That means that if I do my math correctly I can get 6 for the price of 4. When have you ever seen that at the LCBO? Furthermore they are delicious. They are inexpensive enough that I’m going to attempt to saber one open if I can convince my wife that our travel health insurance covers me for accidents related to opening champagne with the back of a chef’s knife. Video to follow.